President Donald Trump speaks to reporters before leaving the White House in Washington for a brief stop at Andrews Air Force Base in Md., on his way to Greensboro, N.C. The Trump administration sent an immigration policy wish-list to Congress that includes overhauling the country's green-card system, hiring 10,000 more immigration officers and building a wall along the southern border. 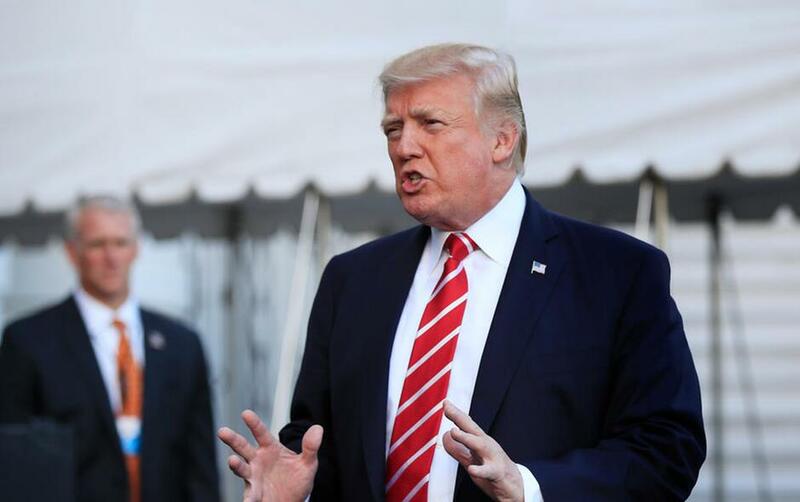 WASHINGTON (AP) — President Donald Trump has told congressional leaders that his hard-line immigration priorities must be enacted in exchange for extending protection from deportation to hundreds of thousands of young immigrants, many of whom were brought to the U.S. illegally as children. Trump's list of demands included overhauling the country's green-card system, a crackdown on unaccompanied minors entering the country, and building his promised wall along the southern border. Many were policies Democrats have said explicitly are off the table and threaten to derail ongoing negotiations over legislation protecting young immigrants known as "Dreamers." They had been given a reprieve from deportation and the ability to work legally in the country under President Barack Obama's Deferred Action for Childhood Arrivals, or DACA, program, which Trump ended last month. He'd also tweeted that if Congress was unwilling to find a fix, he would "revisit this issue!" in six months. Trump had previously said he wanted a DACA deal to include significant money for border security and eventual funding for his border wall. But the priorities released by the White House went far beyond that. In a joint statement Sunday night, Pelosi and Schumer said Trump's list of proposals failed "to represent any attempt at compromise." "The Administration can't be serious about compromise or helping the Dreamers if they begin with a list that is anathema to the Dreamers, to the immigrant community and to the vast majority of Americans" they wrote. "The list includes the wall, which was explicitly ruled out of the negotiations. If the President was serious about protecting the Dreamers, his staff has not made a good faith effort to do so." The demands could also divide Republicans, several of whom have introduced legislation providing a pathway to citizenship for Dreamers in exchange for less drastic changes. House Speaker Paul Ryan's spokesman, Doug Andres, said the House immigration working group will review the list and consult with Republican members and the administration.